The bad news is, it's on back order, not to ship for 2 weeks and 3 days. I got one from tequipment as well! Love it! Much better than the BK I had..
All I knew about was the 5% code, At least others know about the 6% now. Not a biggie to me as the difference was 1%. Oh well a picture will do for the time being. I have this meter also (well the non-E version, but that just means it has more connectivity options). It has been very reliable for me so far. My order status says one day left to ship, but if you look at the page for the DM3058E they don't indicate any in stock. I don't think they are going to arrive tomorrow and ship the same day, but we'll see. Measurements are considered approximate due to uncertainty of measurement equipment accuracy, although should be very useful as general figure of merit. LOL - the shipping date came and went. I knew that was going to happen. The shipping date still says Dec 2. That reminds me of the local power company. When the power goes out and you call to report it, they always give an estimated time of restoration of two hours. Then when the power isn't restored, and you call back, they give another estimated time of +2 hours. In other words, the estimate is not based on anything at all, it's merely designed to keep people from calling back every 10 minutes. It could take all day to fix the problem, but you ain't gonna find that out from calling them. Guess I'll call them at the end of the week and see when they really expect to ship it. I'll probably get an estimate much like the power Co. gives out. Waiting for new gear reminds me of childhood... The last week before Xmas lasts as long as the preceding 51. Nice, I'd like a bench DMM, but, I can't see any real benefit over my Fluke 179. My Fluke also appears to be better spec. 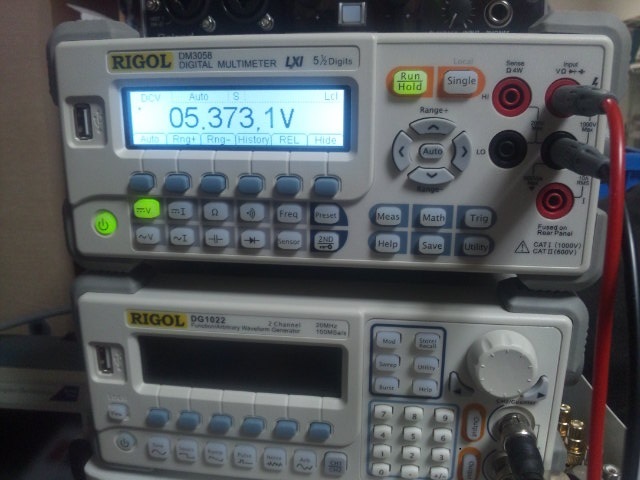 What do these Rigol units do that makes them worth $449? Why would you buy something ready made when you can make it yourself with half the features for twice the money! The Web link and attachment is a Google snapshot (by Google, not me) of the Rigol DM3058 DMM Service Guide when it was on the Internet. This manual is missing a lot of detail due to its being a snapshot (still useful) , and at least you can see what it provides, including a section on Calibration. Knowing that it does exist and the actual name and contents is certainly of some value to us. So we at least now know what we are looking for in terms of Service and Calibration of the DM3058. Have a bit of a closer look at the spec sheet. Where is it you feel the 179 has better specs? As well as raw specs, there's a lot of things bench meters tend to be able to do. No meter yet and no new ship date. Does anyone know what's going on with the supply of these meters? Rigol must be behind in manufacturing them. Guess it's time for a phone call. That kinda stinks. RigolNA is showing the DM3058E as "in stock," but Tequipment only shows them having the DM3068. The problem with ordering from Rigol directly is that you have to pay shipping and don't get the 6% discount. How about a DM3068 (the 6.5 digit sibling)? Might be more stock of those. Tequipment is showing 15 of them in stock. I'd imagine the $350 price difference is a problem for Xrunner. I know it is for me. But I did call Tequipment. The lady checked on the order and asked me if I would hold while she called Rigol. After a few minutes she said Rigol was performing final quality checks on the meters and they would be receiving them in a few days. I said, well I guess I'll really be getting a new meter! She said - You sure will! I'd imagine the $350 price difference is a problem for Xrunner. I know it is for me. $350 difference? I just looked at the TEquipment site and the '58 is $695 with the '68 being $799. You're missing an E. We are talking about the DM3058E, not the 3058. The "E" model is only $449. I asked Dawn on chat today when they would be getting stock of DM3058E and DS1074Z and she said it would be before the end of the year. Thanks. That's more or less consistent with what I've been told. I'm not in a huge hurry for it. I just want it to be perfect. That's all.